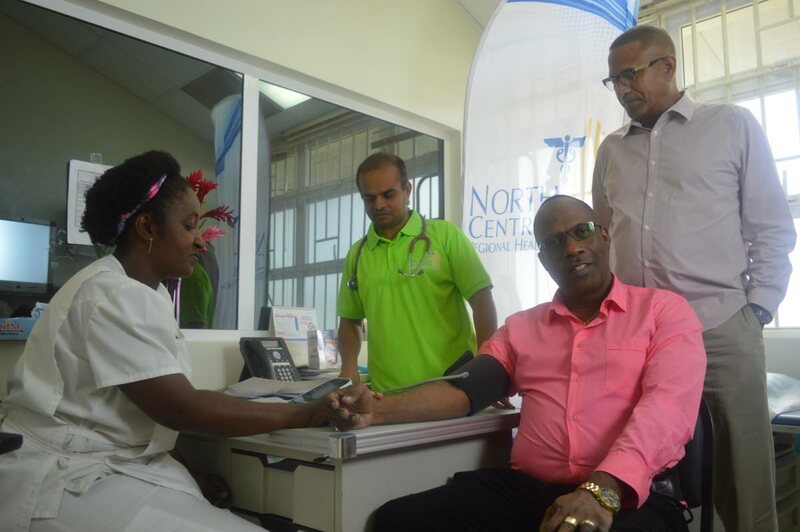 Medical check-up: Nurse Auldith Cato measures the blood pressure of Prisons Commissioner Gerard Wilson at the launch of My Brother’s Keeper at the St Joseph Enhanced Health Facility, Mt Hope. Looking on is NCRHA general manager primary care Dr Abdul Hamid, left, and NCRHA chairman Steve De Las. PHOTO COURTESY NCRHA. Costs for the North Central Regional Health Authority (NCRHA) have decreased significantly since the implementation of preventative health initiatives this year. NCRHA’s CEO Davlin Thomas told Sunday Newsday that, compared to the first quarter of last year, the RHA had seen a 40 per cent decrease in health costs. This, he said, was because of initiatives such as My Brother’s Keeper, which provided free executive medical screenings to members of various communities. The previous project, Ready for the Road, screened approximately 200 leading entertainers, mas camp workers, pan players, and members of the media in time for Carnival 2018. It included full blood works, ECG tests, chest x-rays, eye tests, and a personal consultation with a medical doctor to review the findings. The current project, My Brother’s Keeper, is directed towards active duty members of the Protective Services, starting with prisons officers, and includes a stress test and later on, counselling sessions and stress management training. Thomas said health costs were usually incurred after someone realised they were ill and “explodes exponentially” when the illness was a serious one. For example, he said if a person’s kidneys start to fail, they go to the doctor (personal cost) or hospital (taxpayer cost), have tests done, realise they have diabetes, then a lot of money was spent on haemodialysis. However, reducing costs was not the only aim of the NCRHA. Thomas said as an agency, the staff felt they needed to intervene to ensure that the public in general as well as prisons officers were in good health and knew that they cared. “We want to ensure people know where they are in terms of their health status. He said the NCRHA wanted to initiate a programme where medical professionals would return to the field with primary health care, providing intervention rather than cure. He said they would go into communities or invite members of various communities for screenings. Dr Gerard Hutchinson, psychiatrist and senior lecturer at the University of the West Indies, tailored the stress measurement and management component for the project. His hope was to mitigate stress and empower the officers to deal with it. He said he worked at the prisons, dealing with prisoners and engaging with officers. He said it was already a high-stress job but the officers also had to deal with threats on their lives and that of their families, the additional stress of the deaths and murders of some of their co-workers, as well as the way the general public perceived them. Hutchinson said he was interested in setting up a mental health service for the prisons, including the officers, because mental, cardiac, respiratory and all other aspects of health care were inter-related and should not be seen as separate. Furthermore, he said he hoped to expand this holistic, preventative approach to different at-risk populations. He said, especially with mental health problems, many people wait until things get extreme before they contact a professional. “When you talk to people many say they noticed something different six months ago but because the person was quiet they did not bother to do anything about it. Yesterday brought the number of prison officers receiving executive medical screenings up to about 190. According to the NCRHA, screenings mostly detected cases of hypertension, pre-diabetes, and elevated cholesterol. Reply to "NCRHA costs down 40 per cent"